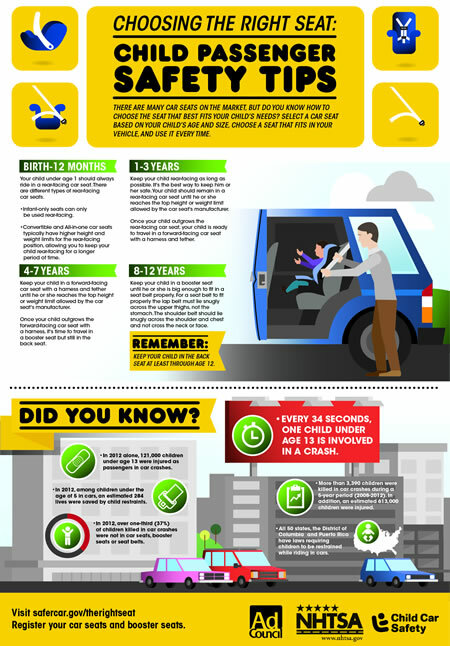 This week (September 14-20th) is Child Passenger Safety week. We are taking some time out to bring awareness to Child Passenger Safety. Please always make sure your children are in the proper car seats, booster seats and seat belts. • Car crashes are a leading cause of death for children 1 to 13 years old. Many times deaths and injuries can be prevented by proper use of car seats, boosters, and seat belts. • To help to prevent major injury to a child, you must ensure that they are in the properly installed Car Seat and Seat Belt. • Only 46 percent children ages 4-7 were properly restrained in booster seats in 2013, statistically unchanged from 2011. • Only 9 percent of children ages 1-3 were prematurely graduated to booster seats in 2013, a significant decrease from 12 percent in 2011. • About 10 percent of children ages 1-3 were restrained in rear-facing car seats in 2013, a significant increase from 7 percent in 2011.